James’ obsession for all things mechanical started at a young age, building model airplanes on the kitchen table with his Engineer father. This obsession shifted to dirt bikes, then into his realized passion: cars. Since then, James worked as a certified Ford technician in the ‘80s, which then transitioned into his first performance gig in 1990 – which is what he’s been doing ever since, for the past 28 years! His first performance job was with Rick Townsend Race Cars, where he learned a valuable skill: complete fabrication, and in James’ words, “how to make things from nothing.” He learned chassis fabrication, roll cages, suspension geometry & design, and these skills got James in the door fabricating parts for NASCAR teams – frame components, spindles, cambered rear axles, etc. James’ parts ended up on cars such as the one Dale Jarrett drove to his first Daytona 500 win! In 2000, James started his own business, where he continued his passion for making things from nothing, and making cars perform better. 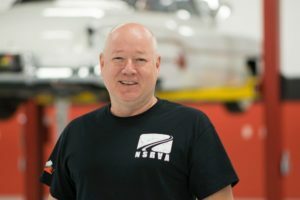 Over the past 18 years, he’s gotten his hands on everything, ranging from working on road-going performance cars (including Subarus, Mustangs, Skylines, Supras, and more), to building a crawler and finishing 10/140 in King of the Hammers, to building & restoring vintage race cars including Elva Couriers, LOLA T70s, Datsun 240Zs, MGB GT V8s, AC Bristols, Triumph TR4s, Austin Healeys, etc. His current projects include an LS3-swapped FJ60 Toyota Landcruiser, a totally bespoke tube chassis/aluminum body/’01 Cobra drivetrain car (seriously, built from scratch), and an E350 Ambulance he converted to a lifted, 4×4, 7.3L turbo diesel repurposed into an RV!